On Saturday the 2nd of February, Matthew Hayden AM officially opened the new Ian Weigh Mahindra dealership in partnership with the Ian Weigh Motor Group, Rockhampton. The new Ian Weigh Mahindra site at 178 Denison St features the new Mahindra showroom presence complete with Brand Story Wall, Pylon Sign and 15 metre road fascia. Along with Matthew Hayden, Weigh Auto Group General Manager Helen Vass and Mahindra's National Manager Ankit Taneja the customer experience and presence were highlighted to a media event at 11am. The late Bill Weigh commenced in the automotive business over 50 years ago with dealerships in Brisbane and Mount Isa. It was just on 27 years ago that Ian Weigh, the son of Bill Weigh started in Rockhampton with the Ian Weigh Toyota dealership. 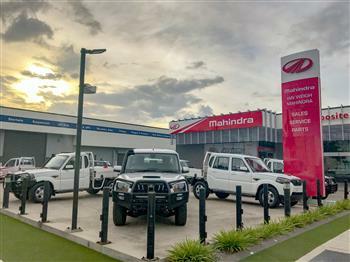 Now numbering multiple franchises, 150+ staff and taking up an entire city block in Rockhampton, it is one of the most unique Mahindra dealerships in the country with the Interstate trainline running right down the main street the dealership fronts. "This is a remarkable success story we are partnering with, success breeds success. The presence is exciting, no question what is sustainable in business starts with a good product. It's my job as a director of the business, but also as an ambassador to make sure the products are sound. I spend a lot of time over in India, I talk to senior management from India. Mahindra is here to prove itself in the developed nation of Australia and I'll do my utmost to ensure the product is well supported and more than anything we are having customers that have great user experience with the product." – Matthew Hayden AM, Mahindra Automotive Australia Pty Ltd Director & Brand Ambassador. A full display of no less than 13 Mahindra vehicles were on display at the Ian Weigh Mahindra launch event in Rockhampton, including the new S10 Single Cab 4x4, Petrol XUV500, Mahindra Retriever Side by Side and the soon to be broadly announced Limited Edition Black mHawk PikUp. Matthew Hayden added "We've just got ourselves into the new PikUp, we've been over at Straddy for the last couple of months where I take annual leave and the product kills it on the sand. The number of vehicles I watch from afar and turn their heads as the PikUp creeps its way up the beach, making no noise and revving under 2000 rpm is in every way surprising and represents really good value." Mahindra Australia started in Brisbane in 2005 with their Tractor business. In 2007 Mahindra Automotive Australia Pty ltd (MAAPL) was formed as a Joint Venture in Sydney with the Tynan Dealer Motor Business. Today, MAAPL operates out of its Brisbane premises, assembling the Worlds #1 Selling tractor, and supporting its 80+ strong Ag & Auto franchised dealer network across the country. The Ian Weigh Mahindra dealership in Rockhampton follows recent appointments of Trinity Automotive Group in Cairns, Tait Mahindra in Goondiwindi and Moree and new announcements to follow later this month in Bowen & Proserpine. The new Ian Weigh Mahindra site at 178 Denison St features the new Mahindra showroom presence complete with Brand Story Wall, Pylon Sign and 15 metre road fascia.